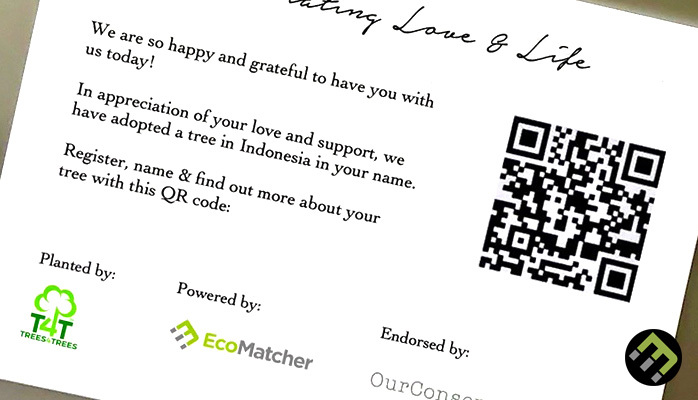 With EcoMatcher, companies can adopt trees and give those trees to customers and employees for reward, engagement, loyalty and event purposes. Those tree gifts are digital products. That has numerous benefits, such as no waste is created which is better for the environment, no cost is involved for expensive tooling and for shipping, etc. EcoMatcher though gets sometimes the request from companies to offer their customers and employees tangible products linked to trees. A TreeCard is a post card (7*5 inch) that can be fully customized in line with company’s branding guidelines. The only thing EcoMatcher adds automatically is a QR code. Once that QR code is scanned, nowadays a standard feature on most mobiles, the TreeCard recipient will be able to track his or her adopted tree instantly and learn more about the tree and farmer. Companies can opt to download the TreeCards as a PDF and print the TreeCards by themselves, or we can do that for you. EcoMatcher works with the Green Pagoda Press Ltd, a bespoken printing company in Hong Kong. Green Pagoda uses soy-based ink and paper from renewable resources, returns all toner cartridges to the manufacturer for reuse and recycling, and even provides two vegetarian lunches to their team every month. The TreeCard can be personally gifted, but you also opt to send the TreeCard by regular post. Please contact us or try it out here.